Dog area: 21.960 square metres, on viale Europa’s side. 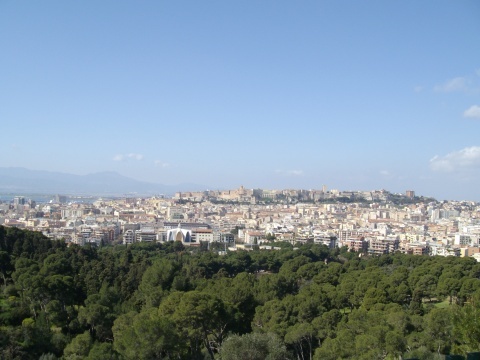 Monte Urpinu, in addition to being one of the most famous hills of Cagliari is also a park in the city centre, easily reachable by bus or on foot . Inside there is a green area ideal for long walks and for sports. Monte Urpinu Park is not so far from the city centre. It represents one of the main destinations for families with children, ideal for a picnic, a stroll among pines and lakes, and it’s also a suitable place for physical outdoor activities. Inside the park there are various species of flora, fauna and man-made lakes inhabited by swans and turtles. It is also possible to see beautiful specimens of peacocks. The main entrance is in Via Pietro Leo, while other accesses are located in Viale Europa and via Vidal, where is also situated Cagliari’s Tennis Club. The park, which originally took the name of Monte Volpino, it was later renamed Monte Urpinu, according to the translation in Sardinian dialect of the word "fox", because in the past the area has always been inhabited by foxes and other wildlife. The car access is always open, while the pedestrian park is open all day all year round. Opening times are variable depending on the season.